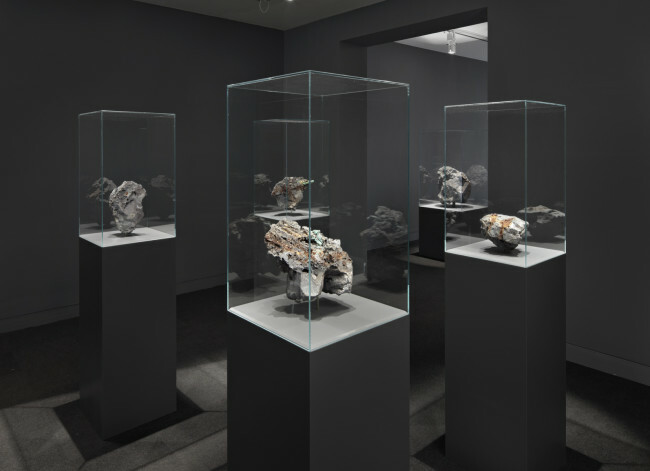 For his exhibition “Into the Hollow”, Julian Charrière transforms the space at gallery Dittrich & Schlechtriem into a cabinet of geological curiosities from a possible post-digital era. 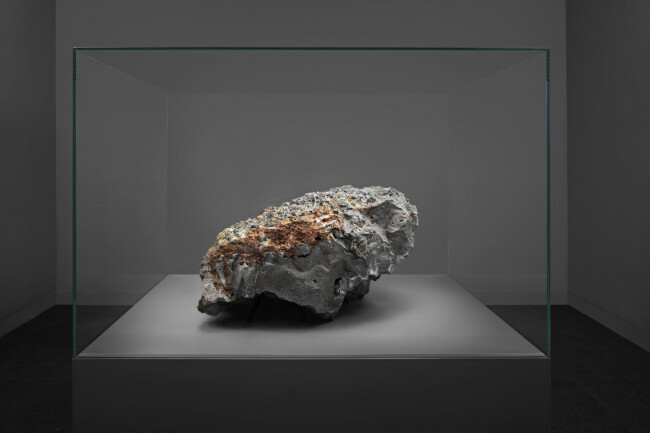 Selected pieces of manipulated molten rock are displayed in vitrines like topological fragments in a natural history museum from a time yet to come. 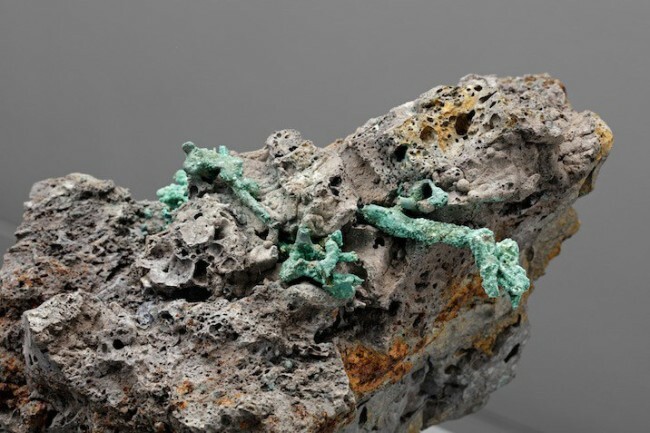 The presented objects are hybrids of congealed magma. 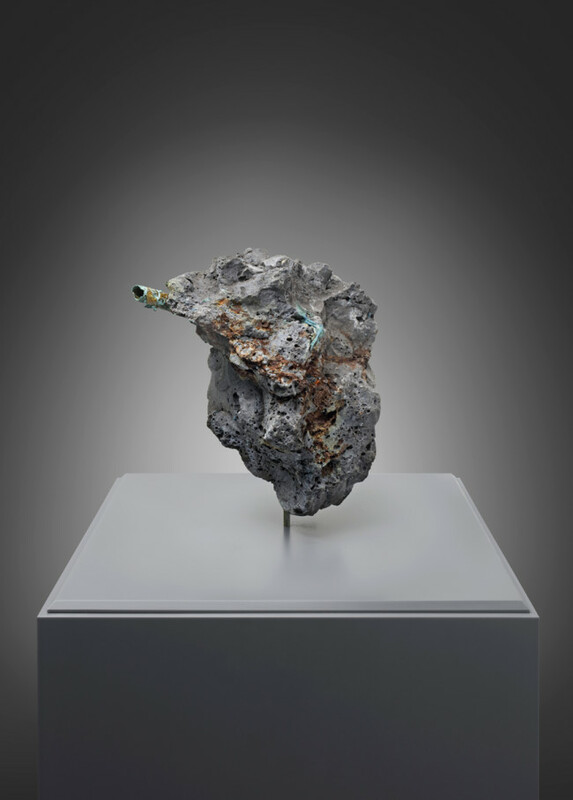 Charrière has melted, transmuted and amalgamated current technological gadgets (smartphones, notebooks, hard drives etc. 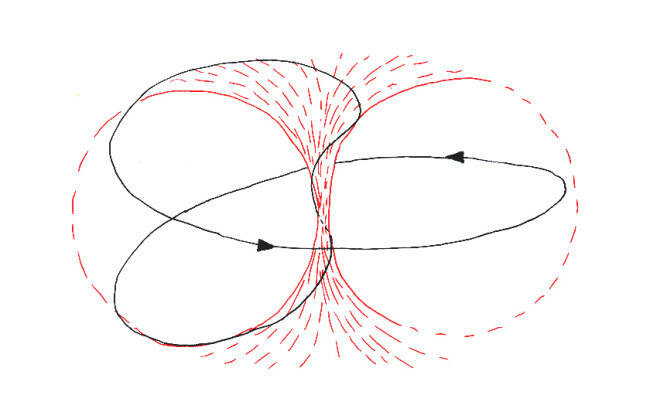 ), including their stored memory, within molten rock. 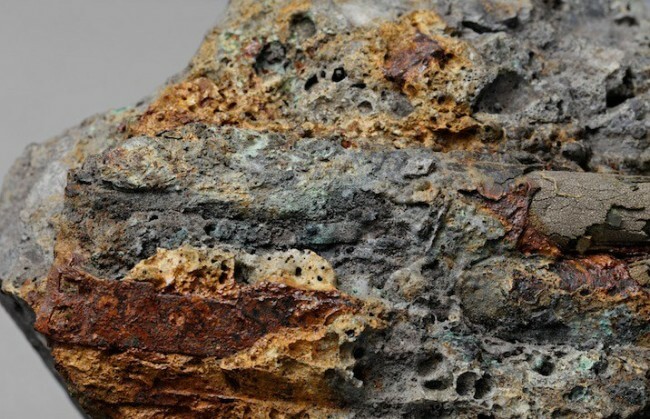 The minerals used for those technical devices are excavated at different locations around the world, then shipped to countries like India, China or the United States to be assembled into technological devices, a process that may be considered a cultural crystallization of a globalized production scheme. Materials sourced from various geographies are brought together in physical objects by which we are all digitally connected. When these become outdated they are sent to e-waste sites, where they are handpicked and separated in order to fuel more technology, thus re-entering the circulation process. Julian Charrière interrupts this recycling flow by prematurely transmuting these delicate devices. Through this forcible intervention, he initiates a geo-artistic reflection on our digital consumer culture, a ‘geo-reset’: back to the future. A full exhibition catalog including a text by Paul Feigelfeld will be published and available through the gallery. An interview with Julian Charrière on “Fossiling the Future” by Penny Victoria Rafferty is featured in sleek magazine. “Into the Hollow” is on display at Dittrich & Schlechtriem from 29 April until 25 June 2016. 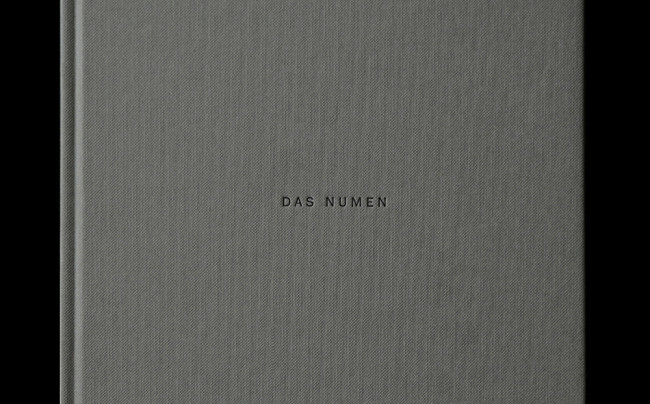 NOWs: Das Numen, Berlin-based artists’ collective of Julian Charrière, Andreas Greiner, Markus Hoffmann, and Felix Kiessling, introduces its first mono-graphic publication by the same name, ‘Das Numen’. The book includes recent and previous projects and a associative reflection on these by Melanie Franke, Carson Chan, Paul Feigelfeld and Otto E. Roessler. The reader is taken on a journey through interlocking references and his own individual experience. The release is accompanied by a reading performance that will take place in the DAZ. ‘The Numen Chorus’ de- and reconstructs the different text layers of the publication with a distinctive noise. The result is a tangible sound experience created by four overlaying reading voices. Readings by: Paul Feigelfeld, Lucas Töpfer, Melanie Franke, Toni Jessen and Anja Schwanhäußer. A bar will offer local cocktails and a hub for the visitors to discuss both the publication and the ideas behind ‘Das Numen’. The launch will be celebrated with specially transformed cocktails made with purified, site-specific water that has been sourced from the Spree river. The evening will be held in German and English. Meet Das Numen at Deutsches Architektur Zentrum DAZ, Friday, May 13, 2016, 7 p.m. NOWs: Das Numen, Berlin-based artists’ collective of Julian Charrière, Andreas Greiner, Markus Hoffmann, and Felix Kiessling, introduces its first mono-graphic publication by the same name, ‘Das Numen’. The book includes recent and previous projects and a associative reflection on these by Melanie Franke, Carson Chan, Paul Feigelfeld and Otto E. Roessler. The reader is taken on a journey through interlocking references and his own individual experience. The release is accompanied by a reading performance that will take place in the DAZ. ‘The Numen Chorus’ de- and reconstructs the different text layers of the publication with a distinctive noise. The result is a tangible sound experience created by four overlaying reading voices. Readings by: Paul Feigelfeld, Lucas Töpfer, Melanie Franke, Toni Jessen and Anja Schwanhäußer. A bar will offer local cocktails and a hub for the visitors to discuss both the publication and the ideas behind ‘Das Numen’. The launch will be celebrated with specially transformed cocktails made with purified, site-specific water that has been sourced from the Spree river. The evening will be held in German and English. Meet Das Numen at Deutsches Architektur Zentrum DAZ, Friday, May 13, 2016, 7 p.m.